Now that our eZine is going strong, I'd like to gauge interest in a sister project. 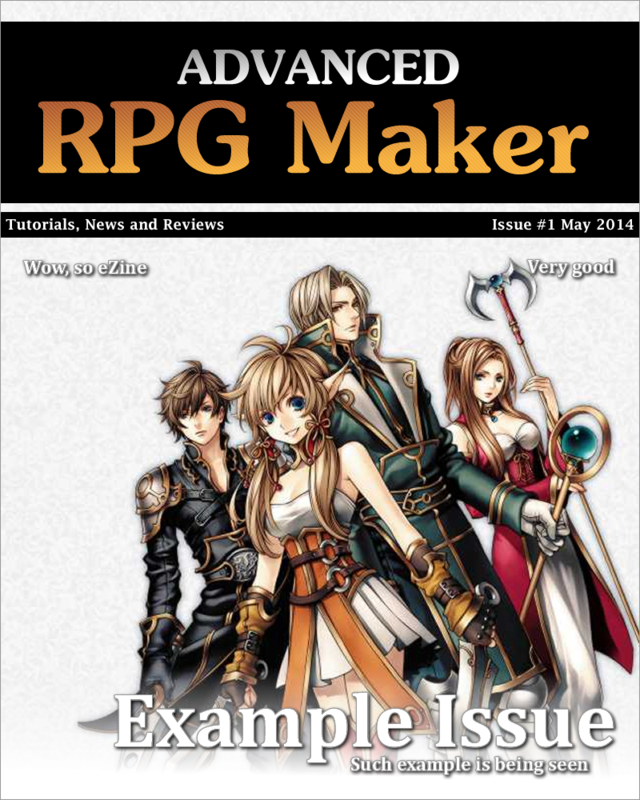 Advanced RPG Maker is a cross-site, RPG Maker only eZine, of a similar vein to the HBGames.org eZine. Released monthly, it is a compilation of tutorials, reviews, news and other info about RPG Maker, its games and its users. The eZine would be hosted here, and primarily discussed here, but it would be posted on, and created in collaboration with, members of many RPG Maker websites, including the official forums, which would be its main audience. It would provide the entire RM community with a substantial, quality publication. I intend to make a thread on the official forums soon to see how many people are interested in it, and if we can get some good contributors going providing content for it. The eZine would be released monthly, as a sister and companion to the HBGames.org eZine, which would continue to be monthly but sit inbetween, half way through the month. My bad, I didn't intend this to appear on the homepage, that's a side effect of where I've posted it. I'll leave it though, if it gets good comments for it. Sounds like a great idea, especially making it a cross-forum thing, you should definitely go to the official forums and see what their members think! This could be a sure thing to get us some more members! I say you should try releasing at least one issue and see what happens. Yeah, just checked it out and it's great that they're up for it, hopefully we'll get more people contributing to it too! Well it's not so much replacing the HBGames eZine, it's going to be made alongside it... or that's what I'm getting from what he's said, lol. Which would mean the HBGames one could be made just for us and be a little more silly and stuff! I like the idea of interacting with other communities. Gives us a friendlier image than I imagine we currently look. I like games. I like you. Check these out; we'll play as two. Not everything can be / should be about look. Should still be happening. I haven't had any submissions (but was suggested to actually go out and do journalism, which is fair enough). Prince and her knight flee a kingdom turned on them, and calling upon the blood pact between the kingdom of heaven (angels) and the kingdom of earth (men), they ask for an angel to deliver them from darkness. Unluckily for them the prince of the demon appears. I've bought aRPGMAKER.com and directed it to the RM boards, not sure if that will help Google etc, might help with marketing all the same. Issue 2 is mostly planned out now, with some small spaces for any submissions between now and release. Feel free to send or suggest anything. OK guys, penciled in date for issue 2 is Friday, 16th May, all things going to plan. Issue 2 is now finished, so any submissions will now go towards issue 3. Will be released this Friday. The next issue will have a small contest in it. I'd, of course, like to make sure this compliments, not detracts from, us, so if anybody has any ideas on how to make it work well for HBGames (while still being good for the overall Community) let me know your thoughts. 13/20 done, with ~4 to 5 of those 7 reasonably planned out. Just searching for more things to spotlight. It feels like when I'm working on the eZine or ARPGM, I'm sitting here doing lots of stuff, but completely blank on the forums. I think I'm going to have to come about a new way of doing things such that developing the eZine or ARPGM is more of a community thing, in a way like how we did the blue redesign. I'm just mumbling at this point but appreciate your thoughts on how it could be a more open process. I'm thinking of having an articles submission forum where people post articles instead of sending them to me, so that there is discussion and crowd-sourced development of said articles until they're finished, maybe. I just stumbled on your magazine and I really, really liked it. I hate that there were only three issues produced, but I downloaded them all and even registered here so I could comment. I don't know if you are even considering reviving this, but you may have better luck when the new edition comes out as people will be looking for information on it to come up to speed as quickly as possible. Last years timing might not have been as good due to the product being well established with lots of tutorials and information already available. That said, you need contributors or you are stuck doing it all yourself. You may need to reach out to individuals specifically to get content. If you see something interesting in a game demo, maybe ask the author if they would be willing to do a write-up showing how they did it. If it took a bit of work, maybe it would continue across a couple of issues "Stay tuned next month for Part 2 - Finalizing the Scoring for our Mini-Game". You can offer having their game featured in a future month to try and build momentum on their work as an incentive for them to write something for the magazine. You could also feature an artist and maybe provide a couple of themed sprites, items, etc. Would be even better if they were exclusive to your magazine so people had to come here to get them, but that may not be feasible. Just some thoughts, but again, I really enjoyed your magazine. Oh, hi... sorry about that. I think I put too much into it and it sortof fizzled out. I'm not sure why I stopped to be honest. Probably a bad thing that it was only one person putting it all together. People seemed to stop asking for it so it stopped coming. I couldn't keep the motivation up. I'd love to get this going again but I only seem to get inspiration for articles every now and then. I need discipline. There is about six pages left if anyone has anything to add. Nearly finished, expect it in the next few days. Any submissions or ideas for #6? Maybe you could wait and see if they announce IGMC 2015 winners this week?